The Skinny: Great fun starring Andy Lau and Stephen Chow. Content-wise, this is typical Wong Jing, but the terrific stars and fun schtick make for a good time. Megastar comedian Stephen Chow plays the Handsome Tricky Expert Koo, a professional trickster who'll play tricks for a fee. He's hired by the scummy Macky (Waise Lee), who wants to oust rival Chi Man-Kit (Andy Lau) from the workplace. 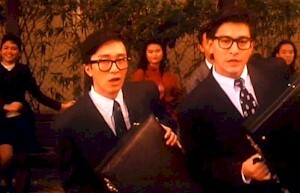 Koo takes the job, and pretends to be the long-lost son of Lau's father (Ng Man-Tat). Somehow the scam works and Koo is brought into their home and family. Tons of bizarre schtick follows, which leads to the obvious question: Will Koo go through with the plan to take down the good guys? Or will he act on the behalf of jerky yuppies like Macky? Wackiness exists from frame one of this obvious Wong Jing product, which is largely a series of parodies, sudden musical numbers and simply bizarre behavior that would never be tolerated in any form of reality. It's also great fun, as it gives Stephen Chow the chance to once again prove his superiority over friends and foes alike. His actions may break his surrogate family, but he can also bring them back from the brink of disaster. His actions can also net him the attentions of the comely Banana (Chingmy Yau), and save Kit's relationship with Lucy (Rosamund Kwan). Boy, Stephen Chow is just all powerful in these movies, isn't he?